On Sunday (Jul-01), I passed a big milestone on my way to Kona. I finished the Great White North Triathlon 2012 with a solid performance. Of course, there is still a lot to improve but given where I am right now and what I have trained so far I am very pleased with my result. This race was the end of my first training block in which I focused mostly on speed and interval work and not on volume (you can read more on that here). My second training block is heavily tailored for a fast bike split in Kona, but also has a focus on reinforcing my running speed and increasing distance. Now, I have a week off, and then 14 hard weeks of training ahead of me. Sanja, Jan, Lenka and I arrived at Hubbles Lake bright and early with enough time to spare. Lots of friends were there and the University of Alberta Triathlon Club had a huge contingent of people racing and also spectating. Although the weather forecast didn't really look nice, Keegan, Derek, Emily and Antony rode out to Stony Plain on their bikes even though it was raining till about noon! THANKS GUYS!!! Also a huge thanks to Andrea, Lenka and Becky for taking awesome pictures of the event!!! Since I experienced some restriction in the shoulder area with my old wetsuit, Dave gave me his wetsuit for the race, which is way more flexible. Thanks Dave!! I seeded my self in the front and a few minutes later the race was on. For me this was the roughest start ever! It was super wild and intense for the first couple hundred metres. After the first buoy the field was stretched out a bit and things calmed down. The rest of the first lap as well as the second lap was normal again. I exited the swim with a time of 29:34 min and headed on to the bike. Again my transition wasn't the fastest and I still have to put some more effort into getting things changed quicker. I left transition, passed the huge support crew and was out in the rain for the next 2+ hours. Although it was raining and a bit chilly, I was very focused and didn't mind the rain at all. In terms of effort my goal was to average 300 watts which worked out very nicely! My actual average power was 301 watts. After about 20 km into the race I got passed by Trev Williams, whom I know is a time trial specialist, and I tried to keep him in sight. However, looking at my power output I knew this wouldn't be a good idea. So after about 10 km, I decided to back-off again and do what I wanted to do. Before the turnaround I rode up into fifth place and then shortly later I was in fourth position in which I remained till the end of the race. On the way back my power slightly decreased, and my heart rate immediately dropped as well (see Figure below) - and this time it was not necessarily the fact that it went slightly downhill (see previous race report), but rather a lack of strength to keep pushing the 300+ watts. But this will be very thoroughly addressed during the upcoming 14-week training block. I came into T2, put my socks on (which proved difficult with cold fingers and feet), shoes on and off I was. Again, the transition could have been quicker, but given the conditions I guess it was okay. Good thing I had fair amount of baby powder in my socks and in my shoes, which helped to dry up my feet a bit. I started running at a good pace and I didn't feel any cramps on the first kilometre. But then after 2 km my good old friends Musculii vastus-mediales (left and right) begun to dictate the pace for the next 2 km or so. I finally managed to convince the two to work with me and from that point on I was running a consistent 4 min/km pace! Never done before in an Half Iron distance race ever! At the halfway turnaround point I saw Ben and Becky and I still felt pretty good at that point. I also saw all my other friends who were racing, as well as my Fiera Race Team buddies. Thanks to Josh who was yelling and screaming when I came by. This definitely gave me a push! Also on my way back to the finish, I passed the soaking wet UofA TriClub crew and a few minutes later Sanja and Lenka. Sanja already spotted me before I could see her, but I knew I was close since I heard her screaming at the top of her lungs :) Even though I cannot see her sometimes, I always can hear that she's there for me! I also saw Darren who only signed up for the race because Sanja did - and then she got pregnant ;) So, he ended up doing the race although he was actually not planning on doing it this year. But still, he looked like he had a good time :) Thanks for cheering Darren! On the very last turnaround point I saw that James Curran got very close in the end. Not to risk losing 4th place, I picked up the pace and ran sub 4 min/km for the final 2 kilometres. In the end I was still 33 seconds ahead of him and enjoyed my arrival! 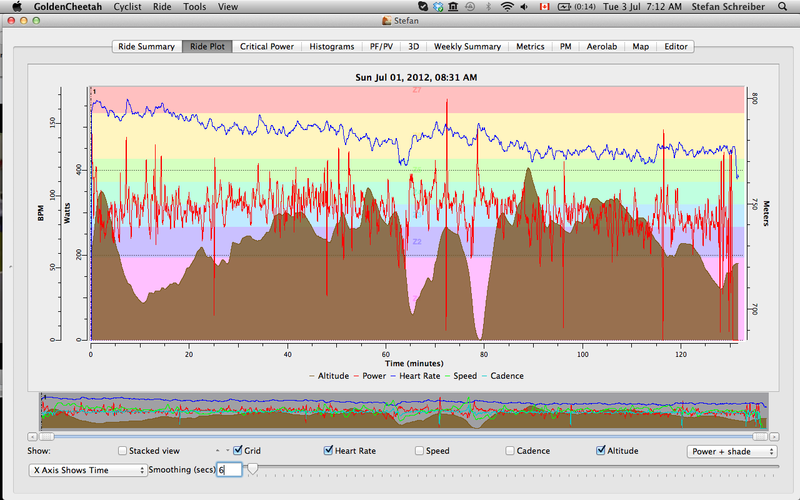 This time my heart rate data actually suggest that I was racing. My average heart rate was 149 bpm and I spent 56:34 minutes between 148-163 bpm, and 28:55 min between 132-147 bpm. And what was really cool is that I felt my outer thighs were getting sore at the end of the race, a feeling which I usually don't experience very often since mostly I cannot run that fast to make them hurt. To sum it up, this race turned out to be a great day, despite the rain, and I am very happy with my result. It definitely showed that I am still improving and certainly haven't reached my limit yet. It gave me motivation and I am looking forward to the next 14-weeks of training! Thanks for reading and happy training! P.P.S. Pictures will follow! Stay tuned!